Estadio de Mestalla is the home stadium of Valencia FC with a capacity of 55,000 seats, making it the fifth-biggest ground in Spain. First opened in May 1923, the venue is famous for its steep terraces and vocal home support which can create an intimidating atmosphere for some teams. The Mestalla stadium first opened to football fans on the 20th May 1923 with Valencia hosting local rivals Levante UD in the inaugural match. With an initial capacity of 17,000, Estadio de Mestalla replaced Valencia’s first home, Algirós which lacked the necessary facilities to propel Los Murciélagos (The Bats) onto the centre stage of Spanish football. Unfortunately the Spanish Civil war put the brakes on any progress for the club, and Mestalla was used as a concentration camp and storage facility meaning that the stadium became into a state of disrepair until the early 1940s. After a lot of renovations, Valencia won their first cup title in 1941 with the Copa del Rey after defeating Espanyol, followed by a succession of three league titles and two further league cups. With this onward momentum, the club drew up plans for expansion dubbed “Gran Mestalla” which took the capacity up to 45,000 in the 1950s before another disaster befell the club, in the form of a flood, when the nearby Turia River’s banks burst in 1957. Once the club restored the pitch, the next decades were characterised by consistent, small improvements and a new bottom tier to accommodate more fans for the 1982 World Cup. Since the 1970s Valencia’s management have always flirted with the idea of relocating the stadium to a new site, but plans have been thwarted by adverse economic conditions and lack of investment. Rather farcically, Los Che have begun to construct a Nou Mestalla with an expected capacity of 75,000 but the project has been temporarily abandoned with the basic concrete structure very much a proverbial elephant in the room. Still, the current Mestalla is the fifth largest stadium in Spain, and continues to host important matches such as 2011 and 2014 Copa del Rey final, both contested by Barca and Real Madrid, Los Merengues. Mestalla is comprised of four sections: Gol Norte, Av Aragon (East), Gol Sur and Av Suecia (West). Away fans are housed within the upper tier of the north-east corner – at least for European matches such as against Stoke FC in 2012 where the size of the travelling contingent is much larger than domestic games. 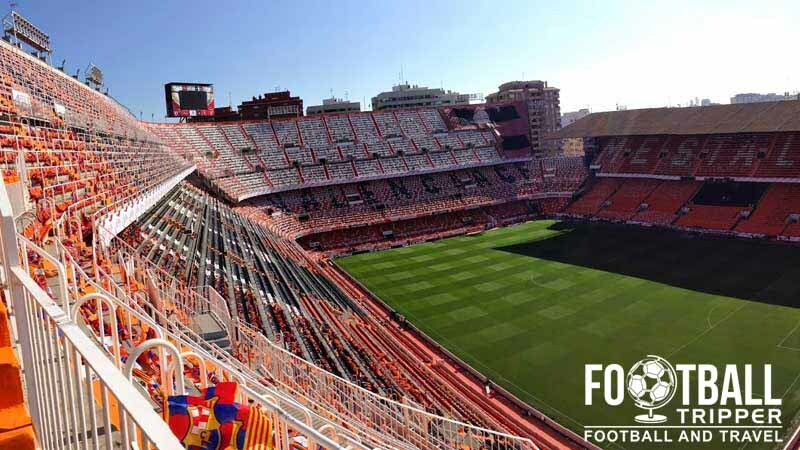 The tier is quite steep with numerous safety barriers but it really helps the Mestalla retain a sense of intimacy despite the outdoors design of the ground. The map below outlines five of the most popular sports bars and Irish pubs in Valencia, both around the city centre and close to Estadio de Mestalla. The stadium is located close to the University Campus which is usually a good sign. Within the immediate vicinity there are a few choices such as Alejandro del Toro, Restaurante Belmonte or Favela Bar Restauarant which can all be found on roads adjacent towards the Southernmost stand of Mestalla. Valencian cuisine is mainly dominated by seafood and meat, with the famous Spanish dish Paella hailing from the region as well as Arròs negre (Rice and Squid, with ink) and Gaspacho, the raw/cold soup. All three are worth a try if you’re into your food but there are also plenty of other options available to try. Valencia’s online club store states that there are six stores throughout the city, but unfortunately there isn’t many clues to their exact locations as the addresses listed are slightly ambiguous. An artistic exterior shot of the Valencia club store in the city centre. Complete with swooping bat on the window. 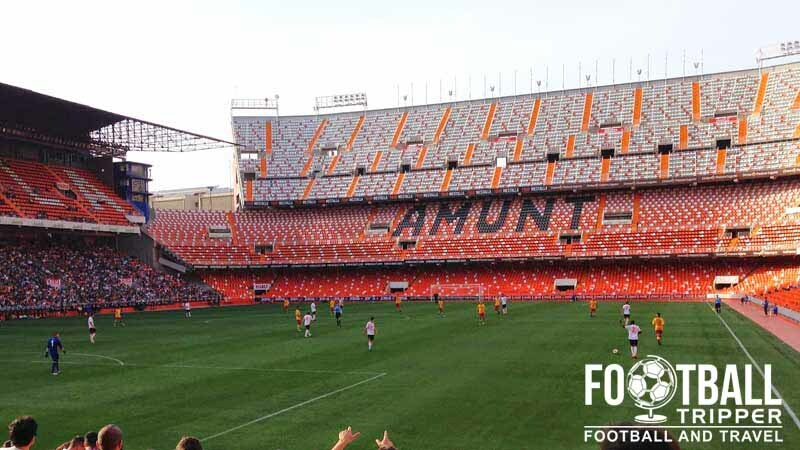 Valencia offer fans of Los Che the chance to take an exclusive tour of the stadium for no more than €10.00 (Adults €9.80, Concessions €7.40 and members €5.30). 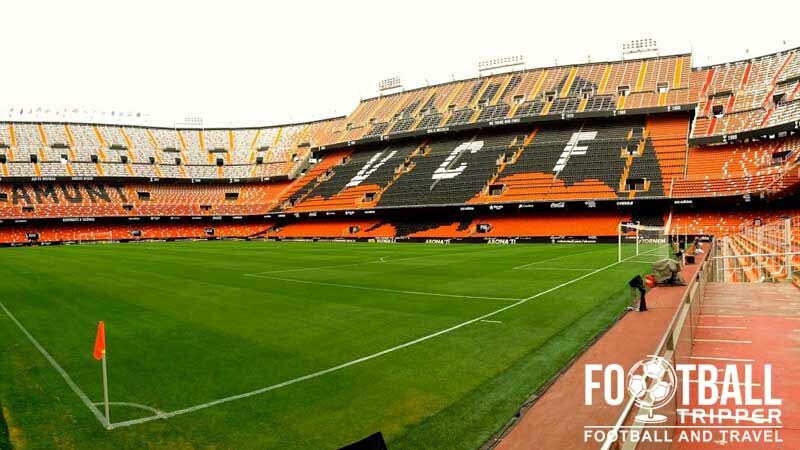 Lasting for approximately 45 minutes, the club are opening the doors to the stadium before they relocate to the Nou Mestalla in the coming years. Note: Tour are only open up to 5 hours before kick-off with no dressing room access. To book tickets you can either do so online, or at any of the Valencia shops. On the day walk ups are fine but subject to availability. Tickets to see Valencia play can be obtained online, at one of the cash-machine sale points or at one of the several club shops scattered throughout the city. Los Murciélagos have one of the highest stadium occupancy rates in Europe and although there might be some tickets for sale on the gate. it helps if you book in advance, gauge the demand based on opposition and not just turn up a few hours before kick-off! Based on a match against S.D Eibar ticket prices range from around €15.00 for a seating behind the goal up to €60.00 for something central, with the average price probably being around €35.00. Remember tickets are likely to cost more depending on who Valencia are playing! Estadio de Mestalla is situated approximately 1.8km north-east of Valencia city centre, even less if you are near to the famous Cathedral. A fine sculpture outside the main entrance of Estadio Mestalla. It can be walked from certain parts of the city centre such as the Cathedrawl within 25 minutes. As there are endless places you can drive to get to the Estadio, I can’t possible cover all routes and journey suggestions! Situated in a dense urban neighbourhood, parking at the stadium is severely limited with the closest good sized car park appearing to be at the nearby University. Unfortunately Valencia’s official website doesn’t confirm if this is suitable for football fans or not. The main train station in Valencia is known as Estación del Norte (Spanish) or Estació del Nord (Valencian) and is situated next to the Plaza de Toros which is the city’s bull killing arena. Around 2km West of the Stadium, as stated above you can walk to the ground in 20 minutes or either choose to take a taxi (outside station), Metro (lines 3 and 5), or bus (Number 10 in Ayuntamiento square, opposite station) depending on what way you are inclined. Like a lot of Spanish cities, the metro is a pretty cheap and efficient way of getting around town, with the Aragón stop, on line number 5 probably being the closest to the stadium. Remember if you aren’t at a station which is on line number 5 then just transfer across to it and work out how many stops it will be. There are maps at every station and inside carriages. The main entrance to Aragon Metro station, definitely one for Lord of the Rings fans. The number 80 is a popular bus for Valencianistas looking to get to the game. 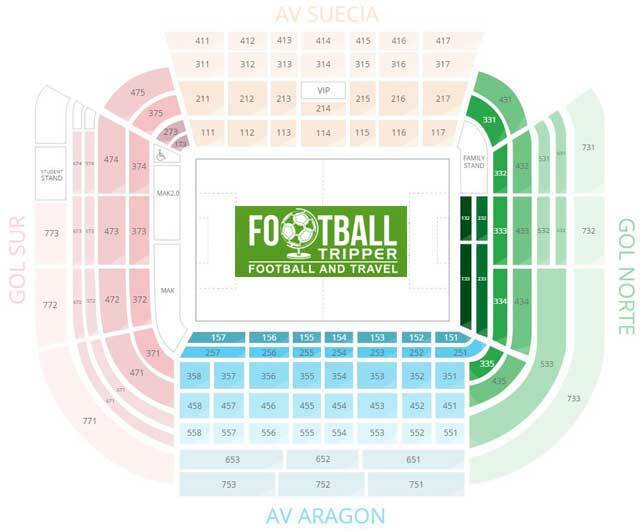 It departs from the main bus station which is based on Aragón Avenue and will drop you off right outside Mestalla Stadium. The main airport of Valencia is Manises which lies 12km West of the football stadium. Serving over 5 million passengers a year across 15 European countries, Manises Airport is the 8th busiest in Spain and full of everyone’s “favourite” cheap airline providers. Once you touch down on Spanish soil you can get to the city either via the A-3 Autovía motorway, the Metrobus or Aerobus which will take you anywhere between 20-40 minutes depending on the number of stops or the old faithful metro service with lines 3 or 5 doing the job adequately. As a large city, and popular tourist destination Valencia has a lot of choice when it comes hotel options for tourists, so it’s best to work what what’s important to you. For hotels near the Mestalla ground, try either the Hotel Renasa or Westin Valencia . For hotels which are central and near the station check out Zenit Valencia and VLC Habitat Centro. Or disregard this and check out a map yourself.